Building a song with great sounding drums is no simple process. There are a lot of elements that can contribute to, or detract from a great sounding drum track. The quality of your kit, drum heads, tuning, muffling, the way you hit, mic type/quality, mic placement, effects, and the other instruments in a song are all part of creating an effective drum track. While building a world class recording setup can take thousands of dollars, and years of research to build, this article will list 13 things that a drummer can do to get the best sounding drum tracks no matter what gear you’re working with. While most of these tips are aimed at drummers, engineers and producers can also learn from these tips. While new mics, drums, or cymbals can be a significant financial investment, fresh high quality drum heads are a relatively cheap investment that can make your drums sound noticeably better. Good drum heads won’t sound good if they aren’t tuned correctly. There is a lot of great information on tuning your drums. Here’s a video from DW’s vice president John Good. A muffled drum sound isn’t always appropriate, but cheaper drums can have unwelcome overtones that make for flimsy drum tones. Muffling with moongel, gaff tape, or even paper, can give your drums a fuller, more controlled sound. *Laying a drum head on top of your snare drum can give it a much deeper and controlled sound. Drums have a different sound depending on where you strike them. Drums usually have the most pleasant frequency when struck in the middle. Hitting the center of the drum, or “the sweet spot” every time will help your drums have a fuller and more consistent tone. Hitting all your drums with the exact same amount of force for an entire song is monotonous at best and obnoxious at worst. You want to emphasize the important notes, and soften the less important ones. Ghost notes and rim shots on the snare are a great way to do this. If you are playing a backbeat with the snare on 2 and 4, make those snare hits rim shots and find some places to throw in some ghost notes on the snare. For this example, ghost notes on the 4th 16th note of every beat can make your groove feel much better. Here’s a video that will show you how ghost notes can improve the feel of your playing. In general, cymbals are much louder than drums, and have a more piercing tone. In recording, cymbals can bleed into all your mics and drown out the sound of the drums and other instruments. If you hit the cymbals softer and the drums harder it will create a more balanced sound and will keep the cymbals from bleeding into the drum mics giving the engineer more control to boost the highs in the drums without boosting the volume of the cymbals. Here’s a funny video to exemplify this point. *Sometimes, recording the drums and cymbals separately can be a way to give the engineer the control they need. 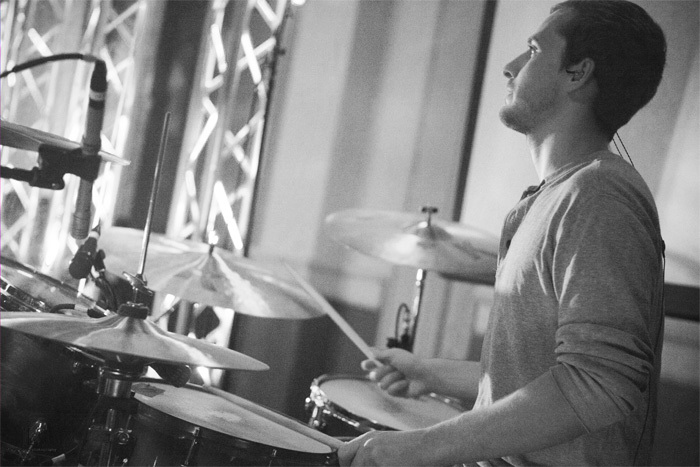 *Most drummers have a slightly stronger right hand and hit a little harder with their right hand. Also, most of the time, the cymbals are played with the right hand. It’s important for drummers to do exercises focused on strengthening the left hand, and to make sure they are solidly hitting the snare with the left hand and playing the cymbals tastefully with the right. Overcomplicated drum parts can take away from the song. The more complex a drum part, the more difficult it is to execute, and the more likely it will get in the way of the parts that the other instruments are playing. For these reasons, complex drum parts are much more likely to make the song sound sloppy than simple drum parts. When creating drum parts for a song, it’s best to try and come up with parts that fit the feel of the song, and enhance its sound rather than worrying about how to show off your skills. If you start simple, it will help you hear where you can add more complex nuances to make a song more interesting. Songwriters will appreciate your care for their songs, and your ability to put your ego on the back burner. Here’s Brad again driving this point home. Many beginner engineers think that the more mics you have, the better, but it’s best to start simple. You don’t need 12 mics to get a good drum sound. Some of the most well known songs in history used only one or a few mics on the drums. It’s impossible for two mics to be completely in phase, and the more mics you have, the more out of phase things will become. The more out of phase mics are, the less low end they have and the flatter they sound. Recording with 4 or 5 mics can sound better than recording with 15. The Glynn Jon’s technique is a great way to get a powerful classic rock sound with only a few mics. This technique was used to record a lot of Led Zeppelin drum tracks. Here’s a video of Glynn Jon himself explaining his technique. If you’ve got an extra mic and input channel, a room mic can add a lot of energy to your drum sound. The room you’re in shapes the sound of your drums. Room mics allow you to capture the sound of the room, and can add a more natural and lifelike sound to stale sounding drums. Here’s a video showing the impact a room has on drum sounds. These days, most of the time, songs are recorded one instrument at a time. This works better if you have limited channels and preamps, and can help the musicians to focus on really nailing their parts. Have you heard recordings where the drums and the other instruments don’t sound like they are losing the tempo, but they just sound like they are a hair off? One way to prevent this is to record the most rhythmic instruments first and then move to the more melodic ones. Start with the drums, then bass, then rhythm guitars, vocals, keys, and then lead instruments last. Recording the drums to a quarter note click (60 – 120) as opposed to an eighth note click (120 – 240) gives the drummer more control of the feel. Playing to an 8th note click makes the drummer more focused on following the click then on playing naturally. This can give the drum track a robotic feel, and create unnatural inconsistencies while the drummer constantly readjusts to follow the click. A quarter note click can be more difficult to play to, it puts the drummer back in the driver’s seat and allows them to have more control of the feel. If they want to throw in a triplet fill, they can do it without the sound of straight 8th notes in their ears. Once the drums have been recorded to a click, turn off the click and record the rest of the instruments to the drums and each other. Every person plays to a click a little bit differently. If the other musicians’ primary concern is playing to the click, the players can end up playing parts that sound good to a click but don’t mesh with the drums. *Recording to a quarter note click isn’t a hard and fast rule, the correct click subdivision will depend heavily on the drummer’s style, taste, and ability. If you are a drummer it’s best to learn how to play accurately to clicks of all different speeds. A good guide track goes a long way. It can be just an acoustic guitar and a vocal, or a demo of the song without drums. The guide track needs to feel good, and shouldn’t stray from the click. If it does stray from the click, then the drummer will have to choose whether to follow the click or the guide track, and won’t sound great. Before you start recording anything to a guide track, you should make sure the guide track lines up with the click, and if it doesn’t, edit it to match up with the click. If for some reason you can’t produce a guide track that lines up with the click, it’s better to just forgo the click, or turn it down during recording. Most of these tips will work most of the time, some of them will only work some of the time, but none of them will work all the time. The worst thing to do is to approach every recording the exact same way. Different genres, artists, songs, and musicians call for different recording techniques and sounds. It’s important to keep an open mind and to experiment to find out what works the best for each project and song. You should approach recording with a “never quit learning” attitude. The more you record, the more methods and preferences you will run into, and it’s best to learn from these and learn how to do things as many different ways as possible.